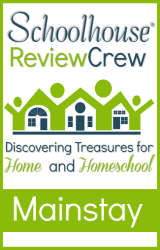 My younger children often want to "do school" like their older siblings so I try to find things they can work on while the older kids are working on their school work. My 4 year old has really been trying to practice writing letters lately so she was excited to receive My First Letters. This workbook comes from Channie's Visual Handwriting & Math Worksheets, which is just one of several workbooks from this company and fellow mom who founded it. This workbook contains 80 pages and is geared for ages Pre-K to 1st grade. Each letter has 3 pages devoted to it. One page that gives practice for the upper case letter, one page where the student learns to write the lower case letter, and the third page give the child a chance to write the letter on their own. 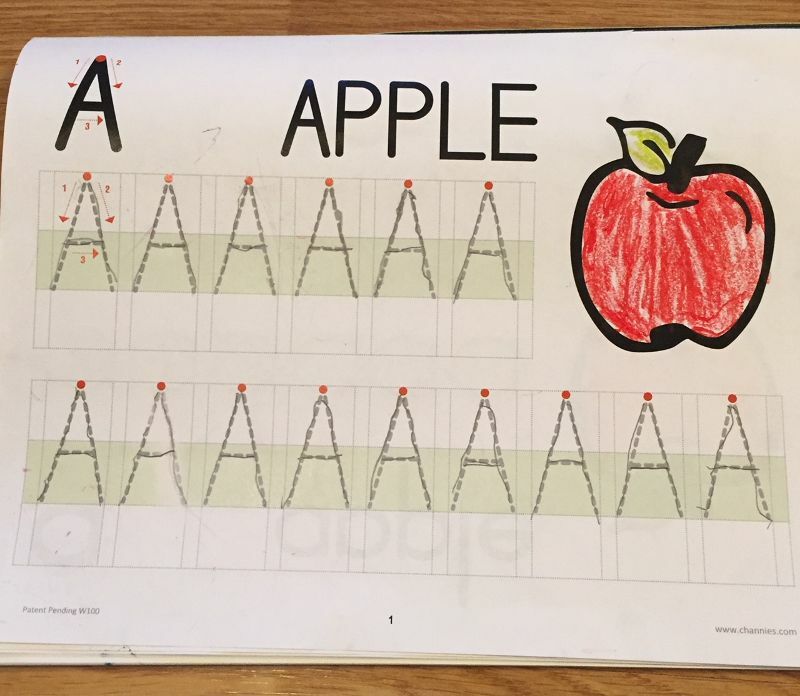 What makes this letter practice different than others we've used in the past is that the blocks are color coded for the child to be able to distinguish between upper and lower case letters. Each letter has numbers and arrows showing the correct direction the letter is formed. 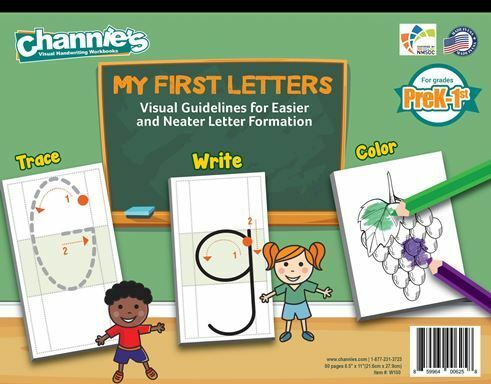 Also included with each letter is a picture that starts with that letter for the child to color. Often times Ava would color the picture before she started practicing writing her letter! At the end of the workbook, there are 2 pages that list the numbers 0-9 for the child to also trace over. A few of the other workbooks that Channie's offers are Easy Peasy Cursive & One Page a Day: Double Digit Math Problem Workbook. Ava and I would typically sit down together to go over what letter we were working on. I would have her trace the bold letter with her finger and show her the direction it is to be formed in. Then I would use her pencil and actually show her how to trace the letter and then I'd let her work on it on her own. She thought she was big stuff being able to practice her letters! Sometimes when it came to writing the letter on it's on, she would only want to do a few at a time. 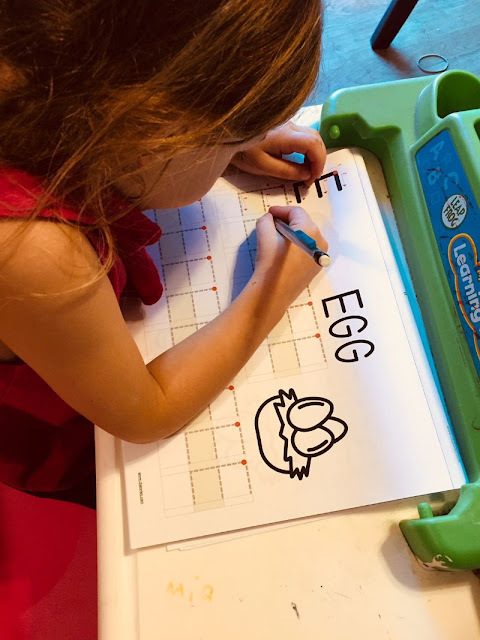 I found it was easier to let her trace a row of the upper case letters, then a row of the lower case letters, then practice the free hand writing for a few letters. Then I would have her go back and trace the rest of the letters before finishing up free hand writing. I found this helped keep her attention span with the free hand writing as well as gave her more practice with tracing again. All in all, this is a great workbook to introduce writing letters. It's simple and the letters are large enough for a new writer to learn how to correctly form them.